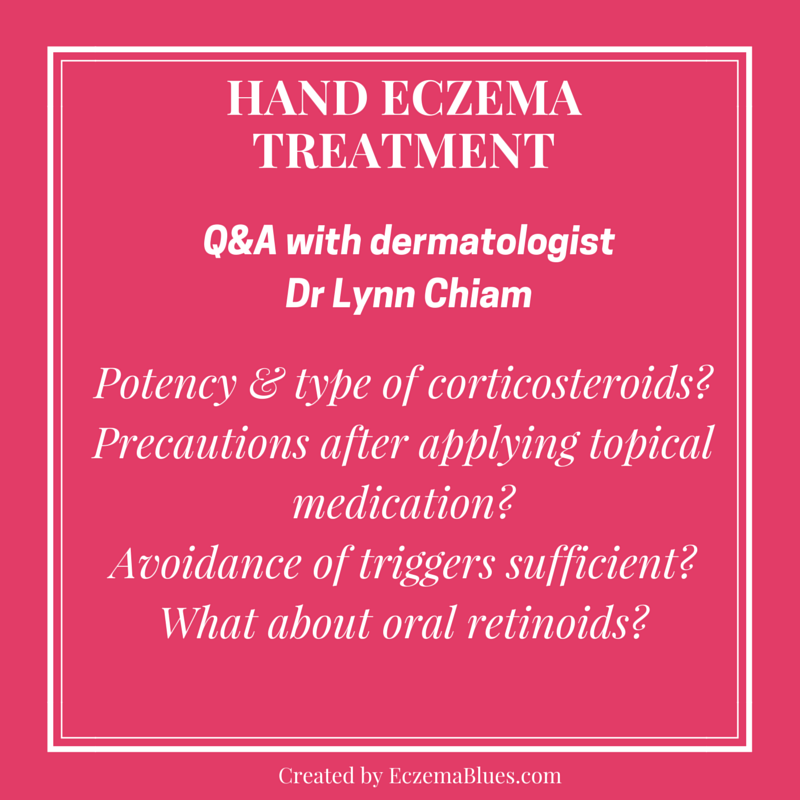 This is a 3-part series focused on hand eczema, with the privilege of having Dr Lynn Chiam, of Children & Adult Skin Hair Laser Clinic, to help explain further the type of hand eczema, its cause, treatment options and daily hand care. Dr Lynn is a consultant dermatologist who subspecializes in paediatric skin conditions at Mount Elizabeth Novena Specialist Medical Centre, Singapore. Apart from paediatric dermatology, her other subspecialty interests include adult pigmentary conditions and laser dermatology. Last week, we covered the basics of hand rash and different types of hand eczema, its symptoms and triggers. This week, we will focus on treatment. For topical corticosteroids, are there typical potencies or type of corticosteroids (such as anti-fungal/ anti-bacterial) that are commonly prescribed for hand eczema? Dr Lynn: Topical steroids are the mainstay of treatment for hand eczema. Topical steroids reduce the redness and itch effectively by decreasing skin inflammation. Due to the thickness of the skin on the hands, higher potency steroid creams are usually used. When used for the correct duration and in the correct amount, side effects are very minimal. Steroid creams should only be used on the affected areas and are prescribed for twice a day use. When the condition has improved, lower potency creams can be used. Sometimes, decreasing the frequency of the creams is also practiced. Topical steroids should always be used together with moisturizers in the treatment of hand eczema. In cases with secondary bacterial infection (especially in those with oozing and cracked skin), topical antibiotic creams can be used in conjunction with steroid creams. For topical calcineurin inhibitor, should sunscreen be used on sun-exposed part of the hand? Dr Lynn: Topical calcineurin inhibitors (TCIs) are an alternative to steroid creams. As they have a slow onset of action, topical steroids are still used in the initially period. Topical calcineurin inhibitors are better used as maintenance agents. Side effects include a mild and temporary burning sensation. They are safe to use and in many studies over many years, they have not been associated with any major side effects or cancers. Eczema guidelines propose that appropriate sun protection measures, such as minimisation of the time in the sun, use of sunscreen after applying TCI and covering the skin with appropriate clothing. Are there any precautions to take after applying the topical medication? e.g. not touch food, water? Dr Lynn: I will normally advise my patients to allow about 15-30 minutes for the creams to be absorbed and to avoid washing hands during this period. Wearing a cloth glove can aid in the absorption and penetration of the creams and allows the person to do work without the creams getting in the way. Does avoidance of triggers play a larger role in management of hand eczema than medication? Is it likely that without exposure to triggers, skin inflammation at the hands will heal itself? Dr Lynn: Although avoiding triggers does help significantly to prevent the eczema from progressing or being more severe, the use of anti-inflammatory agents like topical steroids and calcineurin inhibitors together with moisturizers are still essential to heal the skin. MarcieMom: I read online of a new drug, oral alitretinoin, that has been reported to help with severe hand eczema. However, it has side effects such as headache, dry and flushing skin. It is also not recommended for pregnant women due to possibility of birth defect. Dr Lynn: Alitretinoin has been approved in certain countries for the treatment of severe hand eczema that has not responded to strong topical steroids. It belongs to a group of medicine known as retinoids. Currently, it is still not available in Singapore. Certain blood tests need to be monitored while taking this medicine. Dryness, cracked lips, headache and hair loss may occur. If there is an increase in the liver enzymes and cholesterol levels, the dose of alitretinoin should be reduced/ stopped. In view of the side effects to a fetus, women of child-bearing age should be properly counseled before starting the medicine and contraception advised. Thank you Dr Lynn for explaining the treatment options for hand eczema. Next week we look forward to learning more about skincare and help for those whose hand eczema just won’t go away.